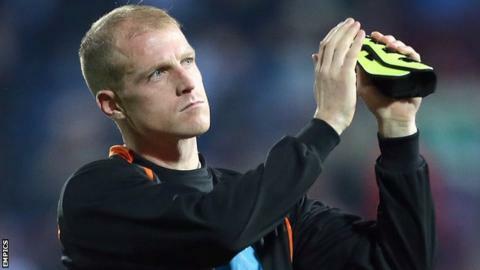 Blackpool have rewarded midfielder Neal Bishop with a new contract that could be extended at the end of the season. on a deal until January. "Coming here on a short-term deal gave me it all to do," the 32-year-old, who has scored once in 15 appearances for the Seasiders, told the club website. "Fair play to the chairman [Karl Oyston]. He said if I came in and did well for him then he'd offer me a long-term deal. He's stuck to his word." "I'd like to thank him and the club for showing faith in me. The contract being signed takes some pressure off me. It's a privilege to be playing here and I'll play in goal if it helps the team." With Bishop's future secure until the end of the campaign at least, he is now concentrating on maintaining Blackpool's excellent start to the season. kept Paul Ince's side in fourth position in the Championship and in touch with the top two. The Seasiders travel to struggling Yeovil on Tuesday and manager Ince, who at the weekend, told BBC Radio Lancashire: "In a way, I'm actually glad they It means we can't go there and think we take them lightly." "It will be a tough, tough game. We go again, that's all we can do, and we'll see where it takes us."